Cleanse the skin and apply an even coat of product to the designed area. Allow mask to dry for approximately 20 or 30 minutes. Rinse off with luke-warm water. Follow with moisturizer. 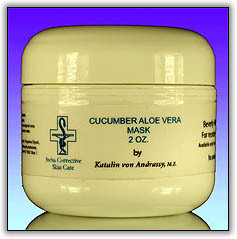 Deionized Water, Cucumber Extract, Glycerin, Panthenol, Propylene Glycol, Allantoin, Aloe Vera, Sodium PCA, Hyaluronic Acid, Carbomer 940, Hydroxyethylcellulose, Diazolidinyl Urea, TEA, Methylparaben, DMDM Hydantoin, FD&C Yellow #5, FD&C Blue 1.